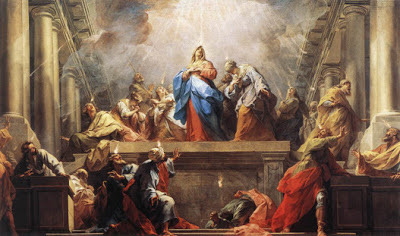 T oday we commemorate the descent of the Holy Spirit upon the Apostles. On this particular day, ten days after Jesus ascended into Heaven, the eleven Apostles were somewhat afraid. They were without their Leader. I am sure that Mary was encouraging them. They were probably praying. Suddenly the room in which they were gathered shook with wind, tongues of flame appeared above each of the Apostles heads. They knew that God was present. In fact it was the Third Person of the Holy Trinity who was there giving them his gifts among which was fortitude. The Apostles were no longer fearful. God was with them. God, the Father, God the Son, God the Holy Spirit were with them. Where one Person is, so are all three. They courageously went into the streets of Jerusalem to preach the truth that their Teacher had taught them. The result? About three thousand were added to their number (Acts 2:41). We are currently in The Year of Faith. Pope emeritus Benedict wanted all Catholics to know the faith better. Pope Francis confirms this desire. It is good to pray to the Holy Spirit while we are learning what the Church teaches. He will make his seven gifts come alive in us and give us a deep interior understanding of it. The gift of wisdom enables you to grasp the beauty and greatness of God and inspires you to choose Him above all things. Knowledge is the gift that helps us to see things as the are in relationship to Gods will; it will show us whether things help us or hinder us in doing his will. Understanding shows us the truths of our Faith without ambiguity. The gift of counsel gives us the power to know the right way of getting to do what God wants. We were given fortitude in order to deal with and overcome any obstacles in our relationship with God. Piety is the gift that makes you know God as a Friend and as a loving and protecting Father. The Holy Spirit gives us fear of the Lord to make us abhor anything that could separate us form Him. The Holy Spirit on that first Pentecost got the eleven Apostles out from hiding and into the streets to proclaim Jesus and what He taught. With our cooperation He will fortify us with the faith, and He will give us the enthusiasm to share it. Today is also Stewardship Sunday in our parish. In May we make commitments of giving time and service to God while in November we consider what treasure we will give to Him though our church. The Holy Spirit inspires us with fortitude to do this. Lets pray that He lead us to make good and lasting commitments.